I woke up confused, do you know me at all? I had a dream…scratch that nightmare…that my Man gave me a prepaid debit card. In the light of day, I reviewed with him why I never want a prepaid debit card in my wallet. Prepaid debit cards are glorified gift cards. One does not need a bank account or a healthycredit score (AKA there is no credit check) to have a prepaid debit card, both of which I deem a necessity. I’ve read that prepaid gift cards can be appealing to some as a way to control overspending and overdrafting. But I can use my regular debit card to control my finances, please and thank you. Remember, I am anti-overdraft protection. The Consumer Financial Protection Bureau that Birdie mentioned yesterday is in the process of regulating this currently unregulated financial concoction. Here are all the problems with prepaid debit cards that need to be regulated. Just look at this list from NerdWallet. 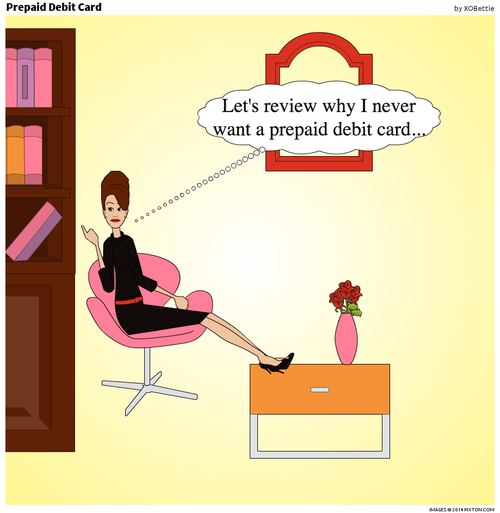 Prepaid debit cards are not money savers. In review, I’ll say “thanks, but no thanks,” to anyone who wants to give me a prepaid debit card. But recently, Ann Carrns reported in the New York Times, prepaid debit cards might not be the worst financial innovation in the world. We can each decide for ourselves!